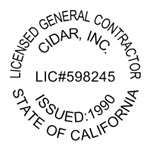 CIDAR Construction holds a Licensed, Bonded and Insured General Contractors License. We are here to help create the kitchen your dreaming about. We offer complete kitchen remodels which includes cabinet solutions, flooring upgrade, and a variety of beautiful counter-tops surfaces. Call us today for a quote!